This is a very rigorous and useful bit of analysis on our jobs situation from a couple of my former EPI colleagues, Heidi Shierholz and Josh Bivens. One of their key points is that what’s uniquely tough about the current job market is not so much the private sector pace of job creation — it’s too slow, but it’s actually pretty close to the pace of the early 90s recovery, and well above that of the 2000s (see EPI’s figure 2). Not that those early expansions were great shakes either, but, at least in unemployment terms, they were better than this one. 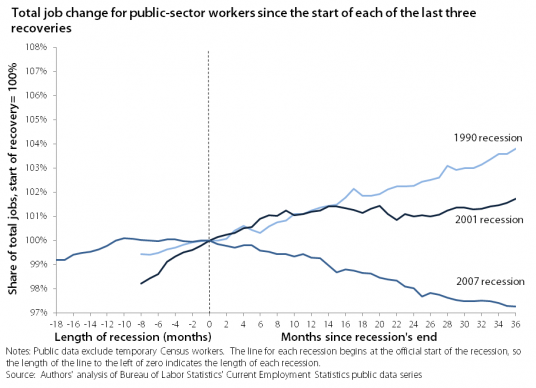 No, the big difference this time, as shown below, is the public sector job losses. This is very much a policy variable — i.e., something we could do something about — but conservatives continue to block the policies that could help offset these losses. These raw numbers of public sector losses get a lot of attention, but the part I wanted to highlight is the private-sector jobs multiplier from public sector jobs. I quote at length here because Heidi and Josh provide an excellent explanation of this overlooked point. However, even that 1.1 million public-sector jobs gap leaves out an important component: public-sector job cuts also cause job loss in the private sector, for a couple of reasons. First, public-sector workers need to use inputs into their work that are sourced by the private sector. Firefighters need trucks and hoses, police officers need cars and radios, and teachers need books and desks. When public-sector jobs are lost, it stands to reason that the inputs into these jobs will fall as well, and indeed research shows that for every public-sector job lost, roughly 0.43 supplier jobs are lost. Further, it should be noted that this 0.67 figure only accounts for private-sector job loss that is due to direct public-sector job loss. But state and local austerity has components besides cutting direct jobs; when these governments cut back, they often don’t just cut jobs, they also cut transfer payments (generally safety-net programs like Medicaid and unemployment insurance which are not associated with much direct public-sector employment, but instead transfer money straight to distressed households). Putting our four components together—the jobs lost in the public sector, the jobs the public sector should have gained just to keep up with population growth, the jobs lost in the private sector due to direct public-sector job declines, and the jobs likely lost when state spending cutbacks on transfer programs were made—we find that if it weren’t for state and local austerity, the labor market would have 2.3 million more jobs today; half of these jobs would be in the private sector. It’s obviously nuts to maintain, as some do, that the government doesn’t create jobs. It creates millions of them, and we very much need them if we’re going to educate kids, drink water, put out fires, have public safety, etc. But public sector jobs also create private sector jobs upstream and downstream. Share the post "Public Sector Jobs Beget Private Sector Ones (i.e., There’s a Multiplier!)" 14 comments in reply to "Public Sector Jobs Beget Private Sector Ones (i.e., There’s a Multiplier!)" I don’t mean to get too far off topic, but the people who need to be convinced on this issue are not susceptible to fact-based arguments. Don’t believe me? Try asking a teapartier at a protest who that policeman over there works for. How does one convert the conclusion into an emotionally charged bumpersticker-length slogan? Yes how do you create an emotional charged slogan supporting people who get pay and benefits the average taxpayer can only dream of? The average taxpayer should join a labor union. I’m a retired private sector worker. My labor union got me good pay and working conditions and has provided me witThank you very much. Put two boys thru college and paid off my mortgage. h a solid pension and health benefits. Seriously, there are reasons the 1% has all the money and the middle class is struggling and one of the reasons is the destruction of labor unions. Just to add one observation based on this excellent analysis, had the public sector grown normally rather than contracting, today’s unemployment rate would be lower than it was under Reagan in July and August of the 1984 re-election year. I wonder what GDP growth would look like today. Slight problem PJR. Government at every level inthis country is bankrupt (and I am not just talking morally). Correct, at least until states/localities see an economic rebound–which requires more jobs. The federal government could fund a lot of state/local employees by eliminating the Bush tax cuts on those earning more than a quarter million per year, and the federal government also can borrow at negative real interest rates right now. Additionally, some states have cut taxes while shedding jobs. Politics is keeping the unemployment rate high. And this is not a new phenomenon. Sure the govts. are bankrupt. They are starving themselves of the revenues they’d have if lots more people were working and paying income and sales taxes. It seems to me you have a serious problem with sample size. You are drawing a conclusion from 3 samples? Really? Furthermore, your statement, “conservatives continue block policies…” is laughable, considering it has been over 3 years since the Democrat controlled Senate has passed a budget. Democrats had complete control of Congress and the Executive branch for two years. What did they do with that power? Republicans have only had control of the house for 1.5 years, and not the Senate. So you have Democrats controlling both the Senate and the White House and it is the fault of conservatives? Laughable. And, 3 samples. Fail. That’s a ridiculous argument; the Senate can’t pass a budget, since any proposal can be filibustered indefinitely by the GOP minority. In addition, whatever else you think the Dems did wrong during their time of control of government, what they DID do was regularly pass budgets and manage the machinery of governance. Yes, the point that cut-backs in government employment and expenditures have held back the economy is certainly correct. As you note here, what distinguishes this downturn from any other in recent decades has been these public sector cut-backs. A similar analysis is provided at http://aneconomicsense.com/2012/06/23/government-jobs-have-been-cut-in-this-recession-this-has-hurt-not-helped-the-recovery/ (showing the paths centered at the cyclical peaks equal to 100), and at http://aneconomicsense.com/2012/07/09/restoring-government-employment-as-a-way-to-restore-full-employment/ (showing the paths from Inauguration day set at 100). But I believe there is an important technical error in the calculations of Shierholz and Bivens, which results in a lower multiplier for state and local government expenditures than would be the case. They use multipliers from Mark Zandi, and assume implicitly that all federal aid to the state and local level is spent either on purchases or on transfers. But it isn’t: a significant part has been saved (paying down the debt, or reducing increases in debt). Correcting for this, the multiplier on state and local government expenditures would be much higher than the 1.24 they calculate. Sure the government creates jobs…the only problem is that government is bankrupt and rapidly becoming more so. Some interesting points, however, there are some blaring items that you fail to discuss. The salaries and monies necessary to fund public sectors come from ‘draining’ it either ultimately from the private private sector as taxes or as loans the private sector ultimately is require to generate the future wealth to pay. You conveniently only discuss the Pros of your viewpoint with total neglect of the Cons. Would you rather have wealth generators like a Steve Jobs, Bill Gates, Henry Ford keep a million dollars to spur additional jobs and wealth for our economy, or take from them and have the government do so. Apparently you believe government would be better at this, but there is Nothing that has ever demonstrated that they are more succesful. You have not looked at all the effects! This is a pretty small multiplier – particularly when all the public jobs and generous benefits are paid for by the private sector, as noted above by Ray. The multipliers in the private sector are much larger than those of the public to private sector – the latter about 1.5 from the above. In the private sector one job at Apple creates 5 elsewhere, and one job at Ford making trucks and SUVs creates 10 as a multiplier – the largest I have seen! Unfortunately manufacturing has all but left CA. The tech cos remaining have made it clear they will not be expanding operations here! 300 candidates lined up to apply for a fireman’s job in Davis, so the public sector is where those with less education can make it big, and retire early! Here in CA we have Caltrans: 8 years behind schedule and 5 times over budget on a section of the Bay Bridge, and in the end they may have botched in forgetting to put epoxy around the huge bolts holding it all together – now they are rusted! And Caltrans is 15 – 20% over-manned according to the State’s independent LAO! We have a carbon tax on all energy – power, gasoline, etc. which makes both gov’t and the private sector less efficient and less competitive!